Abstract: Background: Sub-lexical dyslexia is characterized by difficulty in reading non-words relative to true words. Identification of this impairment requires tests assessing word and non-word reading performances. No such tests are available in Kannada, a South-Indian language. Objectives: a) to develop and validate: Graded word and Graded non-word reading tests in Kannada b) to standardize the tests by administering on 100 children each from Grades III to VII and to establish grade-wise criteria to identify sub-lexical dyslexia. Methods: The Graded Word Reading Test was developed separately for Grades III-VII by compiling 30 words each from Kannada textbook of the specific grade. The Graded Non-word Reading Test was developed by creating 70 randomized non-words. It was then given to 10 Kannada teachers to opine on the pronounceability and suitability of items for target Grades. The test battery was later administered on 25 children with good oral reading skills and subsequently standardized on a cross-section of 500 children from four Kannada-medium schools. This data was used to establish Grade-specific criteria for reading words and non-words in Kannada. Results: The Graded-word and non-word reading test demonstrated good content and face validity. A total of 44 (8.8%) children were identified to have sub-lexical dyslexia across Grades. Conclusion: This novel test battery is first of its kind which also �quantifies� the �relative performances� on word and non-word reading to identify sub-lexical dyslexia in Kannada from Grades III to VII. Dyslexia refers to the impairment of reading abilities encompassing persistent failure to master efficient reading skills despite adequate intelligence, conventional instruction and sufficient socio-cultural opportunity in the affected individuals. In children, this condition is characterized by difficulty converting graphemes (i.e., written symbols) to phonemes (i.e., spoken forms of the written symbols) leading to problems in reading and spelling that may continue to persist all through their schooling and even in adulthood. Dyslexia, however, is not a unitary disorder. Several types of dyslexia have been reported in the literature. [3,4] Phonological dyslexia is a form of reading impairment characterized by the selective difficulty in reading non-words relative to true words. This disorder manifests when the sub-lexical system that converts the graphemes to corresponding phonemes (to derive the morphology of the word) is disrupted. The sub-lexical route is essential while reading novel true words and non-words. The current conceptualization of phonological dyslexia has primarily evolved from the clinical-empirical investigations in alphabetic orthography. In this orthography, each written letter (or letter cluster) maps on to individual phonemes. In addition to this, within the alphabetic orthography, languages differ in terms of the consistency between the graphemes and phonemes. While English is marked by the lack of such consistent grapheme-phoneme correspondence, many other alphabetic languages (e.g., Finnish) show a high degree of correspondence between the written and spoken symbols. Based on the prevailing models of reading aloud (e.g., Dual Route Cascaded Model), reading irregular true words and non-words in English would be highly erroneous compared to reading such words in languages that employ regular alphabetic orthography. Quite distinct from alphabetic orthography, the writing system in most Indian languages employs semi-syllabic (or alphasyllabic) orthography. This orthography is characterized by written characters that map either onto the phonemes or syllables, hence the name �alphasyllabary�. In spite of this hybrid nature of the orthography, the written symbols in this orthography are mostly consistent such that the name and the sound of the symbols in this writing system are the same. Kannada, a language spoken in Karnataka, a southern state in India, is a candidate language that employs semi-syllabic orthography. Like in other Indian languages, a majority of the primary graphic units of Kannada is syllables. From this viewpoint, we refer to the equivalent of phonological dyslexia (in English) as the �Sub-lexical Dyslexia� in Kannada (see Discussion) as this term highlights the mechanism responsible for the impairment according to the DRC model of reading aloud. The DRC model is a scientific construct concerning the cognitive architecture of the information processing system important for reading and spelling. This attributes impaired �sub-lexical� i.e. phonological route to phonological dyslexia. Sub-lexical dyslexia has received considerable attention and is regarded as a unique subtype of dyslexias. While this disorder has been extensively documented in alphabetic scripts (especially English), it may not be readily obvious in transparent (e.g., semi-syllabic) scripts such as Kannada due to the high orthographic regularity. There are a couple of reports of phonological dyslexia in adults in other transparent scripts of Spanish, Danish and Japanese-Kana. However, exploration of the existence of sub-lexical dyslexia in non-alphabetic scripts, specifically in semi-syllabic orthography of Indian languages has been a gray area of research. The sub-lexical (phonological) dyslexia manifests in readers who exhibit a poor reading of non-words in the presence of intact true word reading. Currently, no standardized test batteries of word and non-word reading are available in Kannada. The tests used in India are mostly Western tools or their adaptations. Reading processes depend on the nature of language and features of its script. Hence, the use of language-based tests that are sensitive to the characteristics of each language and its script-specific features are recommended. Prema developed the Reading Acquisition Profile in Kannada (RAP-K), a reading assessment battery to profile the language and reading skills of children learning to read and write Kannada. However this (unpublished) tool does not include any precise grade-wise criteria to diagnose sub-lexical dyslexia in this language. This necessitated the development of a novel battery of word and non-word reading tests to identify sub-lexical dyslexia in Kannada. Specific objectives were to (a) develop and validate Graded word and Graded non-word reading test battery in Kannada, and (b) to standardize this test battery by administering on a group of children from III to VII Grade and to establish grade-wise criteria to identify children with sub-lexical dyslexia in Kannada. We developed separate word reading tests for children from III to VII Grades. A group of 30 words was compiled from the Kannada textbooks of each grade (from III to VII). Selection of items from the grade-specific textbooks ensured that these items were suitable for children in the respective grades and they varied across the grades in terms of their complexity. The Graded Non-word Reading Test comprises of two separate lists of Kannada non-words controlled for phoneme and syllable lengths, respectively. A total of 70 randomized non-words were created by jumbling up Kannada akshara such that they formed novel and pronounceable combinations of akshara without any meaning (egs. ಕೊಂಶಿರ್ /koɱʃir/koMshir, ಎಬಷ/ ɛbɑʃɑ/ebaSha, ಣಗಟವ/nɑGɑnt̻ɑ/NagaTava). The phoneme list included 40 non-words with the phoneme length varying from four to seven (10 items at each phoneme length) and the syllable list consisted of 10 items each in two, three, and four syllable lengths. All non-words could be pronounced through the letter-to-sound conversion rules of Kannada. The Graded Word Reading Test included words selected from the Kannada textbook of respective grades. Items of the graded non-word reading tests were given to 10 Kannada school teachers (with minimum five years of teaching experience) from four different schools. These teachers were instructed to read each non-word carefully and opine on its pronunciation, as well as the suitability for students from Grades III to VII. Subsequent to this, the graded word and non-word reading tests were administered on five children with good oral reading skills (as per class teacher�s inputs) from each grade. Approval from the Institutional Ethics Committee was sought to carry out the study. Clearance from the Deputy Director for Public Instruction (DDPI) of the concerned district was also obtained to administer the reading test on children in schools. Initially, the subject information sheet was presented to the head of each school. A written consent to carry-out study involving children from that school was obtained. Subsequently, assent from each child was obtained before the commencement of test administration. A cross-section of 100 children each from III to VII Grades was recruited from four different Kannada-medium schools in concerned Taluk (a local area of the district). A total of 500 children participated in the study. Those children from Grades III to VII who expressed willingness to participate were recruited to the current study. However, from these groups, children with obvious sensory, motor, or intellectual deficits were excluded from the study. The grade-specific word and non-word tests were administered on each child individually in a relatively quiet room of the school. The items were randomly presented one at a time in flash cards and each child was instructed to read out the stimulus aloud. The responses were marked as either correct or incorrect. In addition to this, 20 Kannada akshara of the Test of Akshara Recognition were also presented to each participant to assess akshara knowledge. The number of correct responses on word and non-word reading tasks was tabulated for each participant in each grade. To identify children with sub-lexical dyslexia, we established specific criteria for each grade based on the accuracy scores on the Test of Akshara Recognition, as well as on the word and non-word reading tasks. Full score on the Test of Akshara Recognition was regarded as the basic requirement for the diagnosis of sub-lexical dyslexia. The sub-lexical dyslexia was considered present in those children who exhibited complete mastery of akshara knowledge with a grade-specific normal reading of (true) words and impaired reading of non-words (see Table 1). The items of the Graded-word reading test are part of the Kannada textbook of respective grades. This, therefore, ensured the adequate content validity of the test stimuli. The content validity of non-word reading tests was assessed by seeking inputs from 10 Kannada teachers from four schools. Though four teachers suggested that longer non-words could be difficult for lower Grades (III, IV) to read, none of them commented on the consistency in the pronunciation of the non-words. Further, 25 �good readers� (5 from each grade) did not exhibit any marked difficulty in reading the items of the Graded Non-word Reading Test, thus ensuring the phonotactic adequacy of the items in this test of the battery. The performance of participants on the Test of Akshara Recognition showed significant effect of the Grade as indicated by chi-square test, χ2 (4, N=500) = 77.57, p<0.001. Table 2 demonstrates that the number of participants who obtained full scores on this test steeply increased from Grade III to VII. The raw scores of each group of participants on word and non-word reading tests were transformed into percentile scores (see Table 3). After inspecting the percentile distribution of the data, we established the Grade-specific percentile cut-off scores (among 10th & 15th percentiles) for words and non-words (among 15th & 25th percentiles) that could be used to classify reading performance as �normal� or �impaired�. Table 4 provides the cut-off scores on word and non-word reading tests across grades. To identify children with sub-lexical dyslexia, we employed the criteria of �impaired� non-word reading skills and normal true word reading skills (see Table 1) in those children who mastered akshara recognition skills (i.e., full score on the Test of Akshara Recognition). A total of 44 children hence exhibited sub-lexical dyslexia in Kannada and Figure 1 shows the percentage distribution of these children across grades. Figure 1. 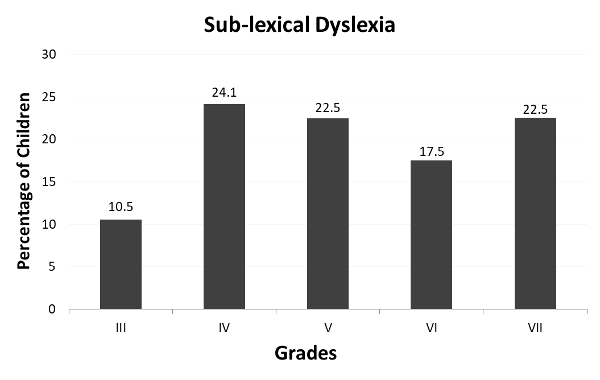 Distribution of children with sub-lexical dyslexia across Grades III to VII in percentage. Dyslexia is a universal disorder of reading that occurs in all languages. However, this is not a unitary disorder as various forms of dyslexia are reported in adults (generally after an injury to the brain) as well as in children. A type of dyslexia that results from impaired sub-lexical (e.g., phonological) processing is phonological dyslexia. This disorder is characterized by a disproportionate difficulty in reading non-words relative to real words. Unless children are specifically made to read non-words, which does not routinely happen in clinical practice, the existence of phonological dyslexia may go unnoticed and such misses may be more in transparent orthographies. The identification of this dyslexia type requires valid tests of true- and non-word reading skills. This study was an attempt to fill the dearth of such tests in Kannada. Before we discuss the development of the test battery, below we explicate the term �sub-lexical� dyslexia. According to the prevailing models of reading aloud in English (e.g., Dual Route Cascaded Model), skilled reading necessitates two routes: viz. lexical and sub-lexical (phonological). While all the known words are read through a sight-word reading strategy using the lexical route, novel words and non-words require a sub-lexical (or sub-word) level processing to derive the spoken form of these words. In alphabetic orthography, where the letters or letter clusters (e.g., sh) map onto a single phoneme, the sub-lexical (or sub-word) processing essentially happens at the phonological level. However, in languages where the written symbols map onto sound units either at the phonemic level or at the syllabic level, such as in alphasyllabary (e.g., Kannada), the explicit use of the term �phonological� dyslexia would prove to be an underrepresentation of the letter-sound mapping. In this context, in alphasyllabic orthographies (i.e., most Indian languages), we advocate the use of term �sub-lexical� dyslexia rather than �phonological� dyslexia. We established the validity of the items in the Graded Word Reading Tests (and thus the tests themselves) by carefully identifying words from the Kannada textbook of respective Grades from III to VII. The items in the Graded non-word reading tests were derived through random graphemic re-ordering and letter substitutions of the true words. Further, to ensure the phonotactic suitability we required 10 Kannada school teachers to evaluate these non-words with reference to the population under consideration. The standardization procedure included administration of the Graded word and non-word test battery on a group of 100 children each from Grades III to VII. The performance of these children was analysed and this data was used to establish the criteria (i.e., cut-off scores) for �normal� reading skills on both word and non-word reading tests for each Grade. These criteria were used to identify children with sub-lexical dyslexia in Kannada. The diagnosis of sub-lexical dyslexia was made with the pre-requisites of complete knowledge of akshara and normal true word reading. Among 500 children who were recruited to this study from five Grades (III � VII), 44 (8.8%) fulfilled the criteria for sub-lexical dyslexia. That is, all these children scored below the grade-specific cut-off scores for non-word reading despite normal true word reading skills (based on the Grade-specific norms) and mastery of akshara knowledge. The number of children who pass these two criteria in the third Grade, more specifically that of complete akshara knowledge, is markedly low (see Table 2, Results). Previous investigations in the same language and similar other Indian languages such as Malayalam have shown that the akshara knowledge continues to emerge even beyond Grade VII. Our data substantiate these earlier findings (see Table 2). Thus, the low frequency of sub-lexical dyslexia in third Grade can be attributed to the smaller number of children who: a) master the Akshara knowledge as well as b) obtain normal scores on true word reading tests in these Grades. The current battery is the first of its kind to gauge the reading performance of children from Grades III to VII on words and non-words through grade-specific cut-off points in Kannada. Thus, this battery serves as an essential tool to identify sub-lexical dyslexia in this language from Grades III to VII. Further, the word and non-word reading tests may be used to assess reading skills of children in these grades. The standardized �Battery of Graded word and non-word reading tests in Kannada� is first of its kind to objectively assess reading performances of children, as well as to identify sub-lexical dyslexia in Grades III-VII. A notable proportion (i.e., 8.8%) of children with sub-lexical dyslexia from Grades III-VII may go unidentified with formal instruction at school. It is pertinent to administer the non-word reading test even in children with intact true word reading skills to detect the presence of possible sub-lexical dyslexia. Thanks to the head of schools as well as class teachers for their cooperation and children for their participation. Thanks to Dr. A.K. for providing guidance on required statistics. Gratitude to head of the department and head of the institution for timely facilitation of the study. This work was supported by the Cognitive Science Research Initiative of Department of Science and Technology, Govt. of India [grant number SR/CSRI/146/2013-G]. Pennington BF, Van Orden GC, Smith SD, Green PA, Haith MM. Phonological processing skills and deficits in adult dyslexics. Child Dev. 1990;61:1753�78. Manis FR, Seidenberg MS, Doi LM, McBride-Chang C, Petersen A. On the bases of two subtypes of development dyslexia. Cognition. 1996;58(2):157�95. Bailey CE, Manis FR, Pedersen WC, Seidenberg MS. Variation among developmental dyslexics: Evidence from a printed-word-learning task. J Exp Child Psychol. 2004;87(2):125�54. Coltheart M. Phonological dyslexia: Past and future issues. Cogn Neuropsychol. 1996;13(6):749�62. Hurford DP, Johnston M, Nepote P et al. Early identification and remediation of phonological-processing deficits in first-grade children at risk for learing disabilities. J Learn Disabil. 1994;27:647�59. Nag S, Snowling M. Cognitive profiles of poor readers of Kannada. Read Writ an Interdiscip J. 2010;24:615-22. Landerl K, Wimmer H, Frith U. The impact of orthographic consistency on dyslexia: A German�English comparison. Cognition. 1997;63:315�34. Paulesu E, D�monet J-F, Fazio F, McCrory E, Chanoine V, Brunswick N. Dyslexia: Cultural diversity and biological unity. Science. 2001;291:2165�67. Orton ST. Reading, writing, and speech problems in children, and selected papers. Baltimore: MD: International Dyslexia Association; 1999. Liberman IY, Shankweiler D, Liberman AM. Phonology and reading disability: Solving the reading puzzle. In D. Shankweiler & I. Y. Liberman (Eds. ), International academy for research in learning disabilities monograph series. Ann Arbor, MI: University of Michigan Press; 1989. 1-33 p.
Paulesu E, Frith U, Snowling M, Gallagher A, Morton J, Richard SJ.� et al. Is developmental dyslexia a disconnection syndrome? Evidence from PET scanning. Brain. 1996;119:43�157. Snowling M. Dyslexia. Oxford: Blackwell; 2000. Prema KS, Karanth P. Assessment of learning disability: Language-based tests. In: P Karanth & J Rozario (Eds), Learning disabilities in India: Willing the mind to learn. New Delhi, India: Sage Publications; 2003. p. 138�49. Prema KS. Reading acquisition profile in Kannada. Unpublished doctoral dissertation. Mysore University, India; 1998. Thapa K, Aalsvoort GM van der (Geerdina M, Pandey J. Perspectives on learning disabilities in India? : current practices and prospects. Sage Publications; 2008. 296 p.
Nag S. Test of Akshara Recognition. The Promise Foundation; 2012. Snowling M, Hulme C. Wells B, Goulandris A. Continuities between speech and spelling in a case of developmental dyslexia. Read Writ. 1992;4:19�31. Karanth P. Cross-linguistic study of acquired reading disorders? : implications for reading models, disorders, acquisition, and teaching. Kluwer Academic/Plenum Publishers; 2003. Tiwari S, Nair R, Krishnan G. A preliminary investigation of akshara knowledge in Malayalam alphasyllabary: Extension of Nag�s (2007) study. Vol. 3, Writ Syst Res. 2011:145�51.